in the galleries or from the publisher. Now only found in private collections. 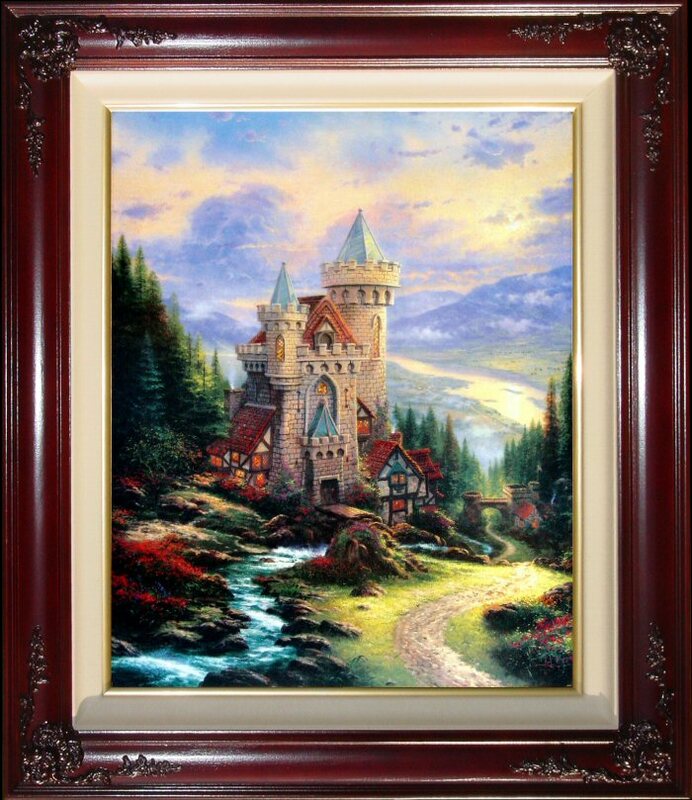 ONLY time Tom created a painting WITH another Artist ~~Thomas Kinkade's collaboration with the brilliant miniaturist David Winter, marks the first time that he ever worked with another artist. ++++ Rare! This Edition is Limited to only 475 in the world! ++++ Brass Plaque with legend "Guardian Castle Thomas Kinkade"
"The best things aren't always the ones you plan. Sometimes, they just happen as if they were meant to be. 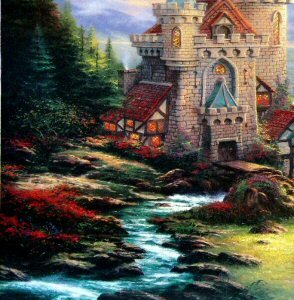 That's certainly true of Guardian Castle, my collaboration with the brilliant miniaturist David Winter. I've long admired David's exquisite cottage sculptures, but my art has always been my own ever since leaving the movie industry. I've never worked with other artists. Until now, that is. Recently, quite by chance, I saw a new Winter work in progress and I was captivated. The miniature castle was so grand, so regal, that it took my breath away. 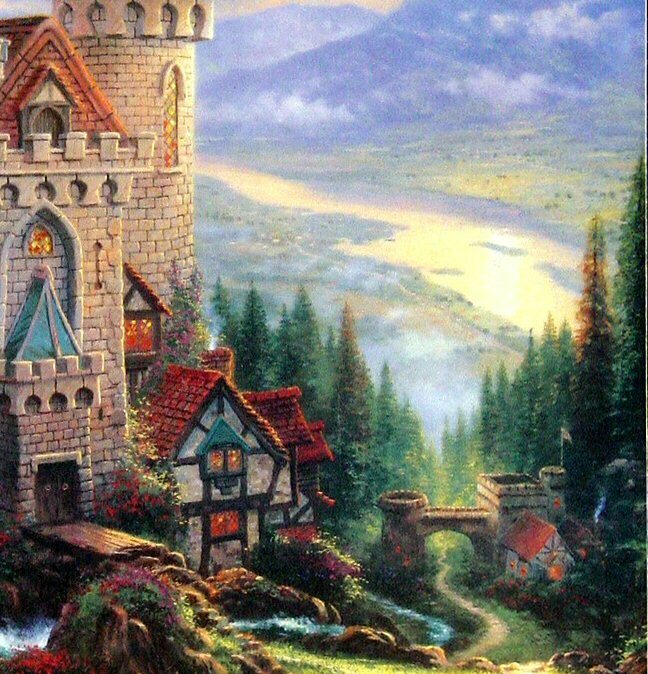 I wanted to see that castle in its proper setting so I sketched it in the ruggedly romantic English mountain country. I showed my vision to David, and it was his turn to get excited; we decided right then on a collaboration. The whimsy and fantasy of David's creation seemed to call for a heroic, naturalistic landscape. Anchored to its hillside, Guardian Castle commands the valley and peaceful village nestled below. 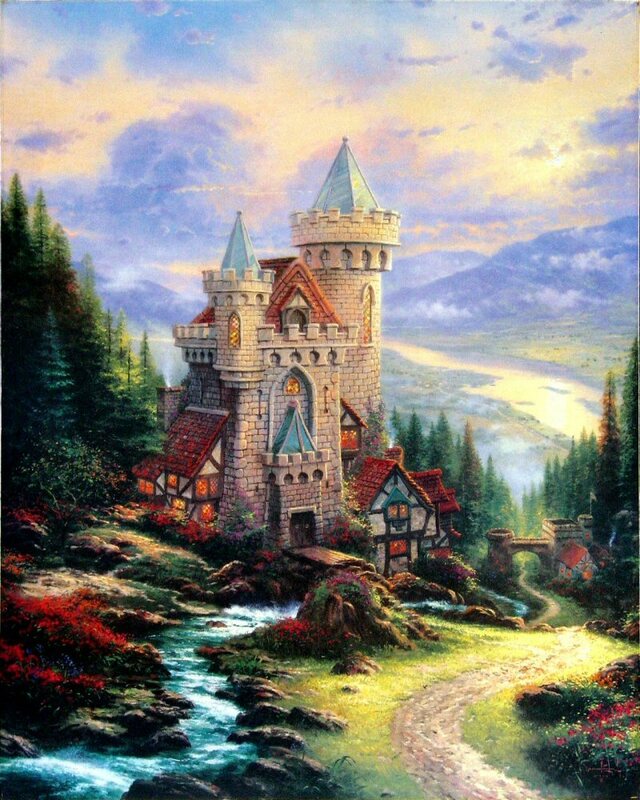 Indeed, the castle assures the tranquility of all who live under its watchful eye, including the "David Winter mouse." I've hidden as a tribute to my collaborator. Can you find it? If not, perhaps you'd have better luck with the hidden "N" located somewhere in David's castle sculpture!"